Here are the ten most popular news articles, week ending 8th May 2016, covering catastrophe bonds, ILS, reinsurance capital and related risk transfer topics. To ensure you never miss a thing subscribe to the weekly Artemis email newsletter updates. The Fort McMurray wildfires that continues to rage in Alberta are set to become the most costly natural disaster event in history for Canada, and as a result losses are expected to hit reinsurance layers and possibly ILS or alternative capital, according to analysts at Deutsche Bank. 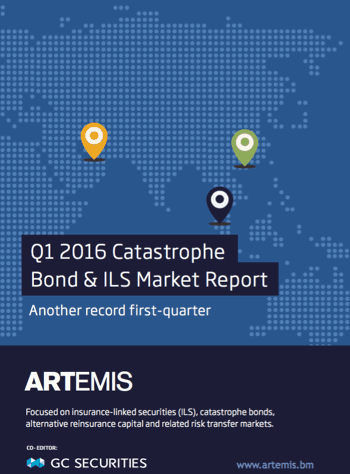 An analyst at BMO Capital Markets estimated the maximum insured loss could be as much as C$9bn (US$7bn). Global reinsurance company Munich Re is returning to the capital markets with a new issuance, as it seeks to expand its capital markets sources of retrocession through a (currently) $100m Queen Street XII Re dac 2016 catastrophe bond transaction. The special purpose insurance (SPI) vehicle has now been registered for investment bank Credit Suisse’s Operational Re Ltd. transaction, which will see the firm look to secure insurance for its operational risks through a catastrophe bond-style ILS securitisation. TigerRisk Capital Markets & Advisory (TCMA), the SEC registered broker-dealer, investment banking, ILS and capital markets subsidiary of reinsurance advisory and broker TigerRisk Partners, has launched an ILS and catastrophe risk trading desk. The high-profile merger during 2015 that resulted in the formation of XL Catlin appears to have had a positive impact on the firm’s reinsurance segment, creating new opportunities and impacting premiums by less than 1%, according to Greg Hendrick, CEO of Reinsurance at XL Catlin. Traditional reinsurance firms continue to launch alternative capital management platforms, as one strategy to offset the challenges of a soft reinsurance market but also as a way to “maintain presence and relevance,” according to broker Willis Re. Insurance linked asset manager Nephila Capital and alternative product specialist insurer and reinsurer Allianz Risk Transfer have partnered to deliver an innovative weather hedging product for a wind farm, in the form of a 10-year Proxy Revenue Swap. Analysts at Morgan Stanley predict that reserve releases will progressively decline in the coming months and years, contributing to as much as a 6% decline in P&C insurance and reinsurance earnings. Watford Re, the Arch Capital and Highbridge Principal Strategies joint-venture investment-oriented, total return focused, hybrid strategy reinsurance vehicle, bounced back in the first-quarter of 2016, with positive investment results driving profitability. Sciemus, the London-based specialist risk modelling and analytics firm for insurance and reinsurance markets, has launched what it terms a “unique” weather hedging management product, an index-based lack of sunlight insurance cover for solar farm operators.